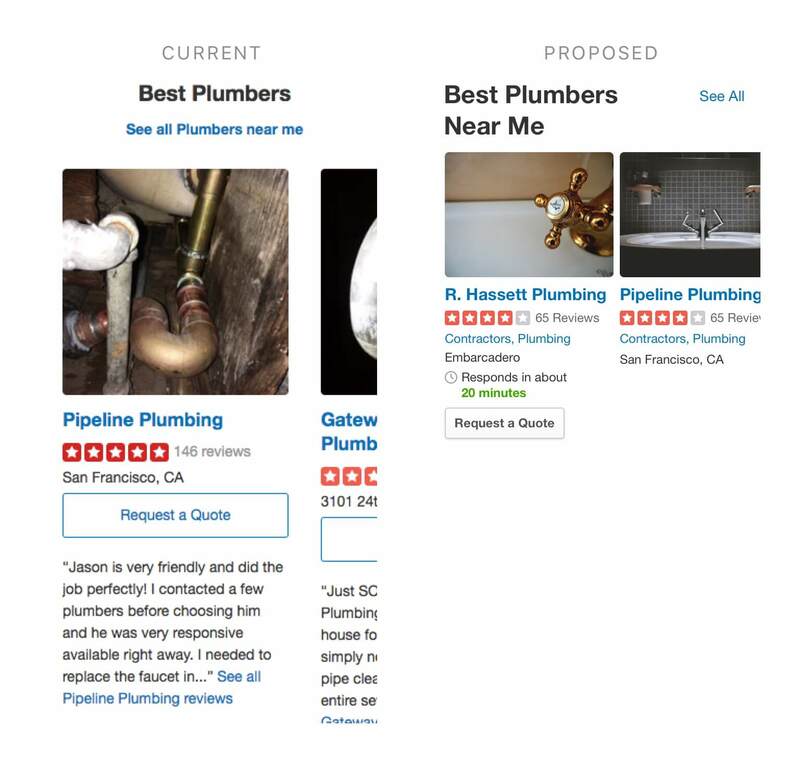 Yelp has several types of pages built to improve its SEO game, but the "Near Me Pages" receive the most traffic today and number to over 2,000. If you were to Google, "Fast food near me", this page type would be one of the top results. Traffic to these pages has been stagnant, so I was asked to look into how we might improve them. 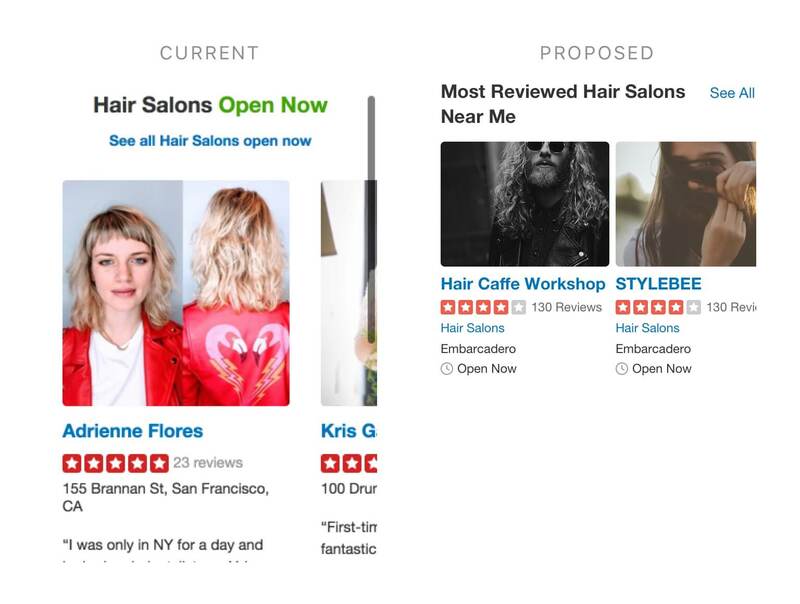 Even slight improvements could boost traffic to Yelp considerably –– to the tune of ~100,000 sessions a month. That could be many people's first experience of Yelp. 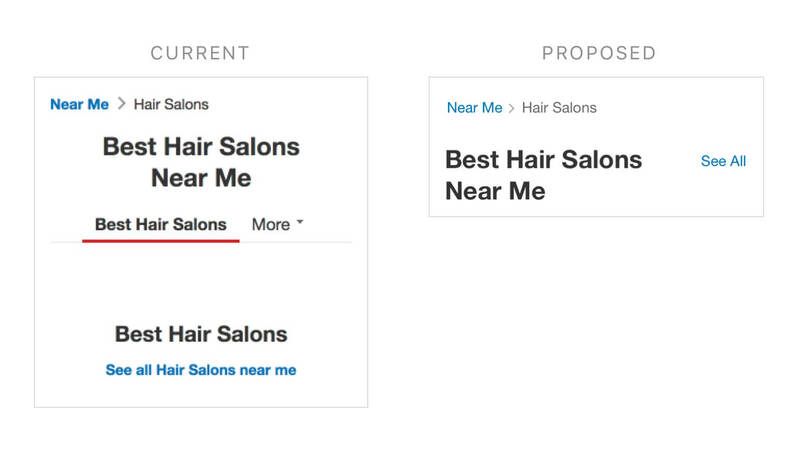 Fortunately for designers and our users, Google rewards better experiences. Since I was new to the Growth team and to the very existence of these pages, I started by documenting visual/UI issues and picking the Traffic PM's brain. The original design was optimized to include a ton of content (the more, the merrier, or so I was told) but not optimized to convert (my opinion). Analyzing our Google Analytics and Splunk data has a decent learning curve, but the engineers on the team were more than willing to help. 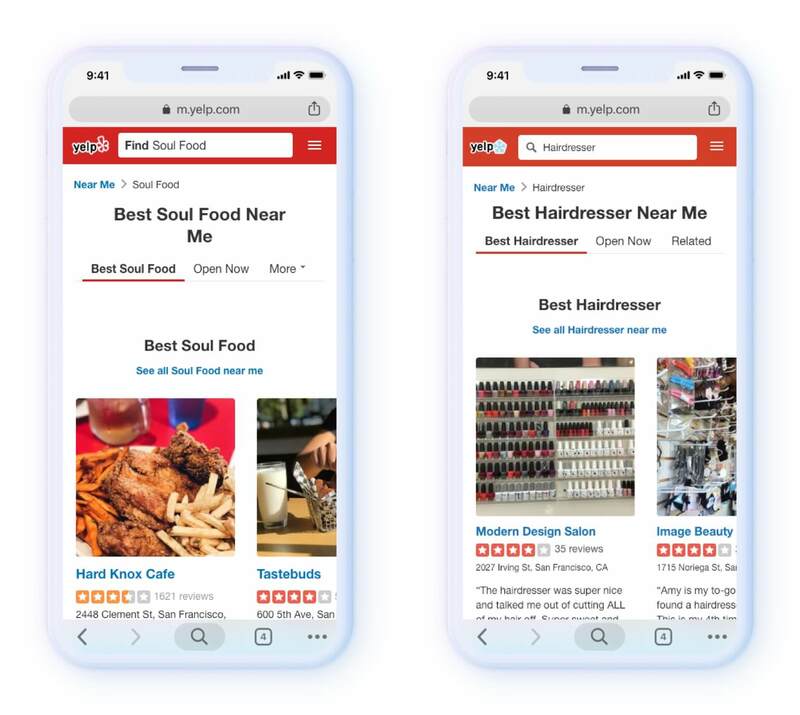 The data appeared to be validating assumptions I had already made – mobile users weren't finding what they were looking for. This discovery process helped me define my principles for the rest of the project. 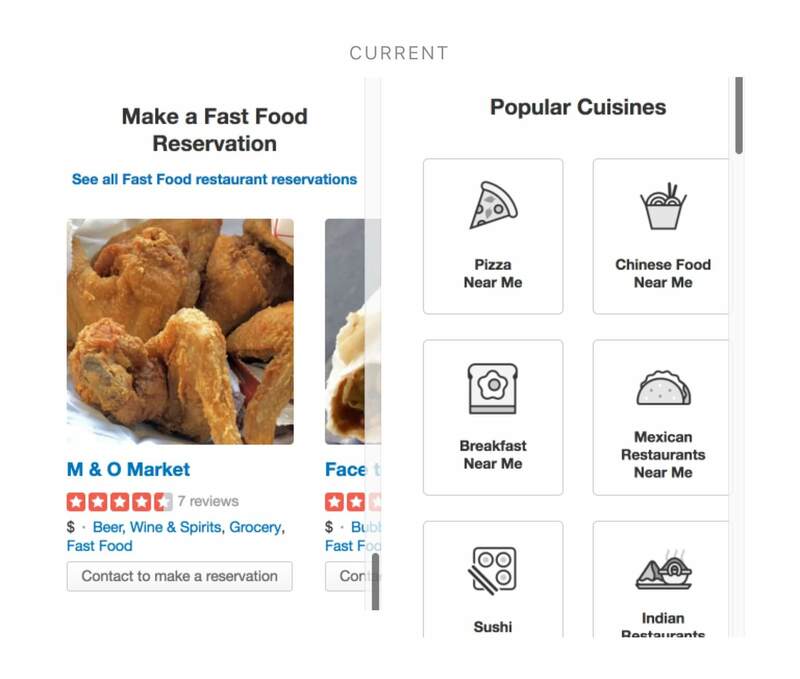 Even though these pages are responsive, because I designed them from a mobile-first perspective, I'll focus on my proposed changes for each section as they would appear on mobile. 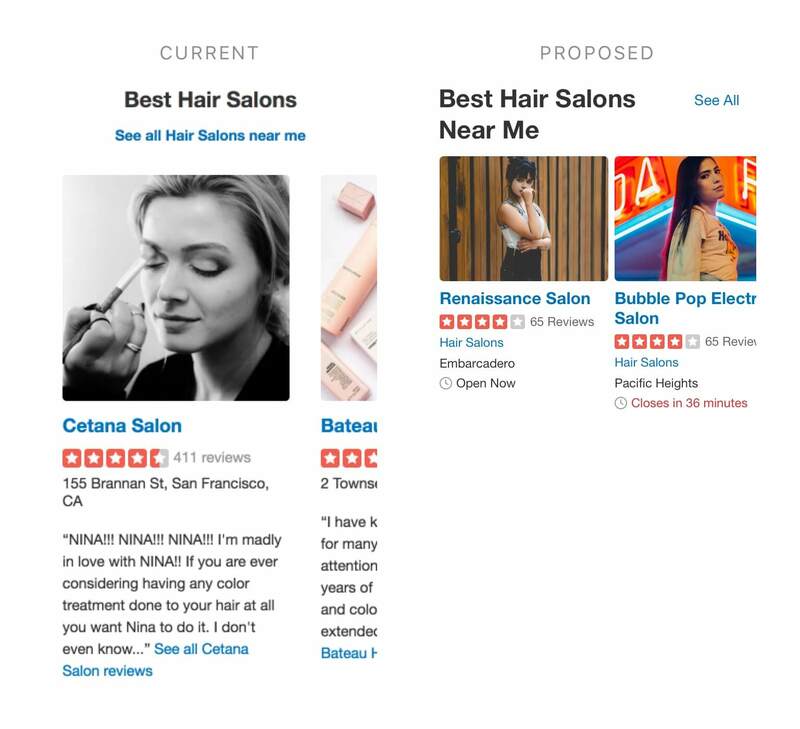 Proposing this call to action is a compromise. In an ideal world, we would know precisely where the user is and be able to show where they are in relation to the businesses near them. But we have to ask for location permission in order to do that accurately, and asking for that up-front seems too heavy-handed. Let's have them explicitly state they'd like to search on a map, and ask for permission to use their location then. 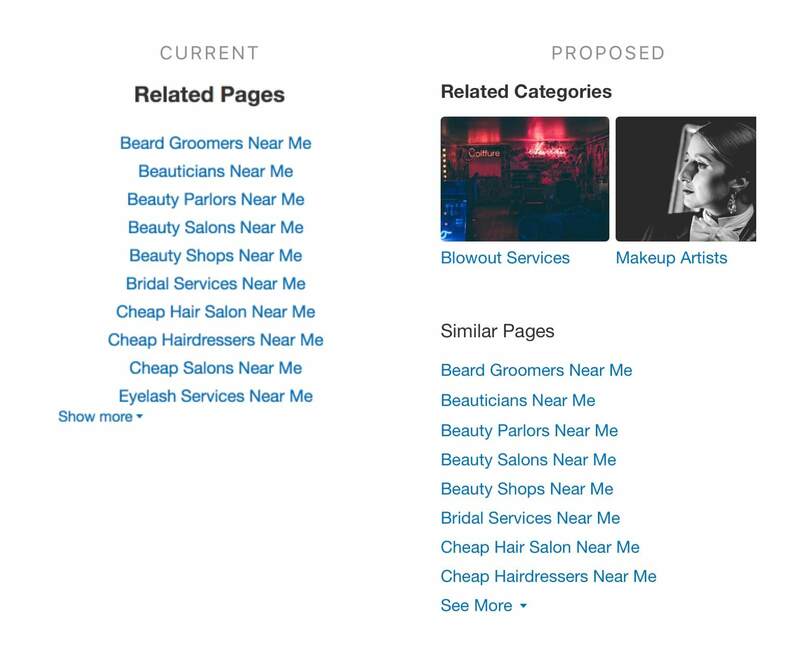 Near Me Pages proposed changes (v2). This is scrollable on all devices! Have a blast. A couple of the proposed changes just ran as experiments over the past month – bounce rate is down and the changes will be shipping to 100%. The bigger bets haven't started being built yet. Unfortunately I did not have the time to explore my last principle to its full extent (Emphasize key information with more focused templates), nor run task scenario testing. For a third version (or redesign), those things would be crucial. 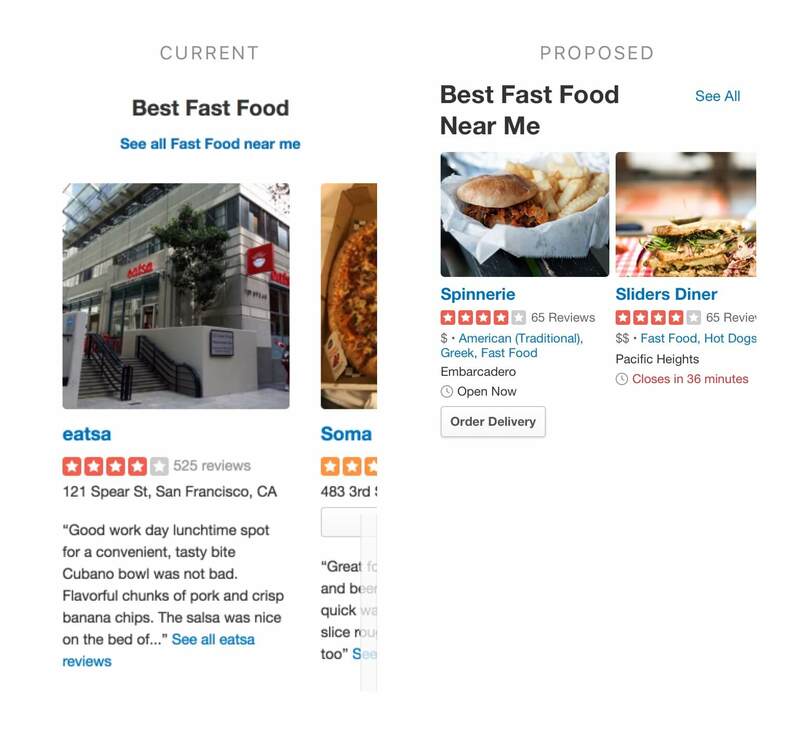 Overall, this project was a relatively small investment, but one I believe Yelp will profit from when fully fleshed out. Time will tell! Onward!